This past month, Camp Bow Wow franchise owners have been doing a lot to shed light on an important topic – dog training. With Train Your Dog Month in full effect, our franchise owners are taking to their local media outlets to share their knowledge with pet parents in need of guidance. Today, we’d like to shed some light of our own, on a spotlight that Kansas City Live recently did on Camp Bow Wow Olathe owner Brenda Heppenstall. 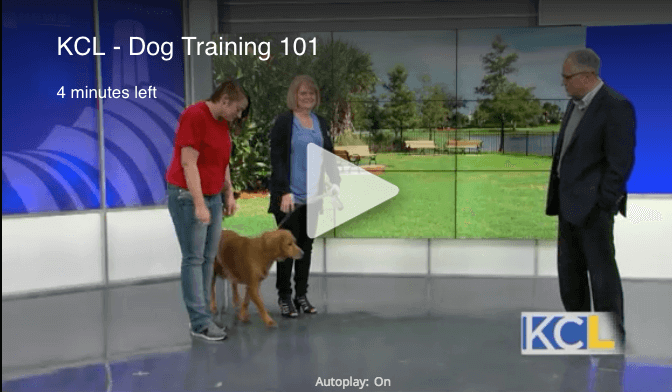 Accompanied by her dog Libby and trainer Lacie Kunellis, the trusted trio suggested some pretty important training tips for pet owners old and new. Start with the basics. Like with most things that are new or unfamiliar, it’s best to begin with the basics when it comes to dog training. Lacie suggest starting with the simple “sit” and “down” commands first. Then, you can build subsequent tricks and commands off of those down the line. Don’t believe the myths! Many folks believe you can’t teach an old dog new tricks, but they’re mistaken! “They’re actually easier to teach,” says Brenda. “They’re a little more focused,” unlike excitable puppies with wandering attention spans. Focus on the bond. The best part of training a dog is building that positive bond between pet and parent. You want to nurture trust, friendship, and also authority. Be patient with pals. One of the more difficult aspects of dog training is getting them to play well with others. The first step is socializing your pet often from an early age, but remember, some dogs take five minutes to be comfortable with a new comrade, while others will need hours or even days. It all depends on their temperament, so just have patience. Allow plenty of exercise. A well-exercised pet is an occupied and happy pet – and therefore a less destructive one! The key to keeping mischievous behavior at bay is a ton of exercise. “A 30-minute walk per day is sufficient for most dogs,” says Lacie. “So, just playing in the house or in the backyard doesn’t really count as exercise.” Fortunately, for pet parents with hectic schedules who have trouble fitting exercise into their daily routine, there’s always Camp Bow Wow! Training a dog is no easy task, but choosing Camp Bow Wow and the Behavior Buddies® training program can help ease the burden. As a franchise owner, you’ll enjoy providing pet parents with a safe place to train and bond with their pups, as well as a resource for learning right alongside them. To read the full article and view the video featured on Kansas City Live, click here. Fill out the form below to receive your complimentary executive summary, or give us a call at (870) 600-2713 to learn more about Camp Bow Wow and our current franchise opportunities.